Al Richmond, at 78 years old, has run every Marine Corps Marathon in the race’s more than 40-year existence. He shares his training plan, motivation and future running goals with WTOP. WASHINGTON — Running one marathon is a feat many people hope to accomplish in their lifetime. Al Richmond, at 78 years old, has run every Marine Corps Marathon in the race’s more than 40-year existence, and is still tentative about when he will call it quits. Richmond, who is gearing up for his 42nd consecutive Marine Corps Marathon on Oct. 22, 2017, said he will not predict when his last marathon will be. He takes great comfort in lacing up his sneakers year after year. “It’s a habit. It’s what I call a rite of fall. ‘Oh fall’s here, OK I got to run the Marine Corps Marathon,’” said Richmond, a former Marine, who has finished more than 50 marathons in his running career. The Arlington resident is a “Groundpounder,” which in the Marine Corps Marathon world is someone who has run every one of the races since the 26.2-mile race was began in 1976. Richmond is the last remaining Groundpounder. Marine Corps Marathon Race Director Rick Nealis says Richmond is a tenacious, humble man whose name is synonymous with the race. Richmond has a distinction most long-distance runners are envious of — he has never been injured. “I’ve been very lucky: I’ve played 10 years of organized football, run 51 marathons, all the training, I have no idea how many 10Ks and 10 milers. I’ve never had an injury,” Richmond boasted. What’s his secret? It’s the same advice he gives any runner: “What has helped save me is not pushing myself. Everyone goes out and wants to win — you’re not going to win the marathon. So run at a comfortable pace and listen to your body,” he said. Running didn’t always come naturally to Richmond. He played football in high school and college and begrudgingly trotted three miles during physical evaluations when he joined the Marine Corps. It wasn’t until a fellow Marine Corps comrade came back from a 10-mile training run for the first Marine Corps Marathon that Richmond entertained the idea of long-distance running. And Richmond wasn’t the only one who just kept going. He was among a small group of Groundpounders who continued running the race year after year. Yet as the group dwindled, Richmond’s competitive drive persisted. “We found out there were six or seven of us, and then there were three or four. I didn’t want to be the first one to not do it,” he said. Richmond kept the streak going for decades — even in 1989 after he was shot three times during a mugging in New Orleans. Then in his 50s, he underwent several major procedures following the incident and lost about a foot of intestine, he said. Complications led him to back out of the race. It wasn’t until October that he had a change of heart, committing to run the race one week before the big day. Richmond embodies the marathon and what makes it special, said Nealis, a fellow Marine who has been the race director for 25 years. “If you look at Al and you know a little bit about him, he could be any other runner that’s at the starting line. He is not an elite runner … and he has over 50 marathons, which is an impressive legacy, but he is your everyday runner. He is the ‘People’s Marathon,'” Nealis said. Richmond cherishes the Marine Corps Marathon, too. The course and support from fans, family members and marathon staff rank it above all other races, he said. Richmond’s training plan and expectations have evolved over the years. There’s a lot more walking, and he knows he won’t be achieving the competitive Boston Marathon-qualifying times of years’ past. “It’s just a case of trying to be prepared enough that I don’t die,” joked Richmond, who has raced in the revered Boston race three times. 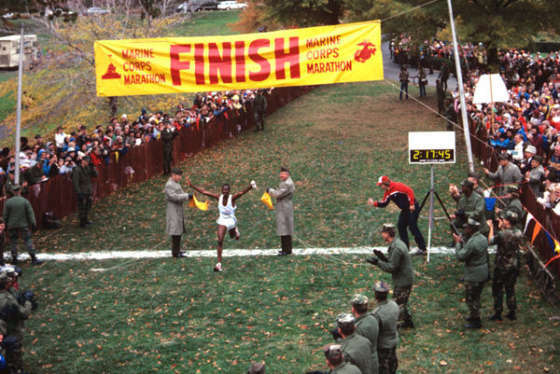 In 1979, Richmond ran his best Marine Corps Marathon time of 3:16:21. His personal best clocks in at 3:00:50. This year, Richmond aims to finish in fewer than six hours. Richmond exudes dedication and endurance in a tough individual sport, he added. For the last four years, Richmond’s daughter — who lives in the Dallas, Texas, area — has run with him. They walk when they feel like it, they run when they want to and they have fun along the way. Still, if you ask Richmond his favorite part of “The People’s Marathon,” he doesn’t sugarcoat it. And when he finishes No. 42 for the Marine Corps Marathon next month, he plans to celebrate the same way he always does.